The events of July 1914 did more to shape the modern world than any others. Several dozen men from a handful of countries, brought about World War One. 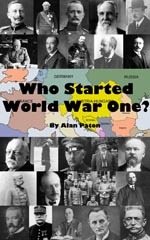 The results of this war include: the collapse of the Russian Empire and the formation of the Soviet Union; the rise to world power of the United States; the dismemberment of the Ottoman Empire, the abolition of the Caliphate, and the foundation of the modern Middle East, whose problems we read about daily; and the formation of five new European nation states one of which collapsed in bloody civil war as recently as 1991. All this, and the deaths of nine million soldiers and at least six million civilians. It also produced the Versailles Treaty which laid the entire blame for the war on Germany and created conditions there which led to the rise of the Nazis and eventually World War Two, and 60 million more dead. Which country or countries is to blame, or most to blame, is still debated today, a 100 years later. This site uses the web to present those events and the men involved in a new way, which may not conclude the debate, but will make clearer what happened. The central feature of this website is the Timeline. We believe it is the most detailed available. The Main Timeline covers 485 critical events (decisions, statements, messages, meetings, and actions) involving 50 or so politicians, military leaders, and diplomats, in Austria-Hungary, Germany, Serbia, Russia, Britain, France and Belgium from the 29th June to the 4th August 1914. The Timeline concentrates on the immediate causes of the war. Most books about the origins of World War One examine the underlying or long term causes; the rival alliances*, the armaments race, domestic issues, cultural trends, and overseas and economic competition, even if they have a chapter on the July Crisis. This is not to say that underlying causes are more important than immediate causes. One type of cause works with the other. If there are no immediate causes the underlying or long term causes don’t cause anything, they remain potential causes of trouble that may change or eventually fade away as has happened many times in history! Equally, a political misjudgement, a foolhardy decision, might not have such disastrous consequences without there being a larger issue. We think the immediate causes bring out more clearly the human factors; ignorance, incompetence, miscalculation, and even bad organisation. And, these were greatly present in July 1914. And, paradoxically, the Timeline with its concentration on immediate causes is a useful tool for a better understanding of long term causes. It draws attention to the occasions when the underlying causes were at their greatest relevance. Why were the Austro-Hungarians so overwhelmingly and so quickly in favour of attacking and dismembering Serbia? What were the German leaders hoping for when they gave their unqualified support to Austria-Hungary on the 5 July? Why on the 24/25 July was Russia so quick to take military steps? Why did the French support them? Did the British really have to delay until the 2 August when Belgium was threatened to make up their mind? Many of the [More] links go into these issues.